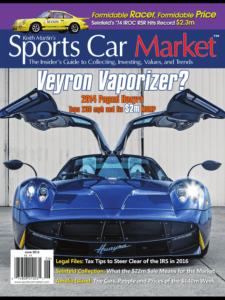 I really enjoy writing articles for Sports Car Market magazine. Archives of my prior articles can be found here. Last month, SCM’s editor Chester Allen asked me to write about the recent sale of a rare Pagani Huayra. This ultra-exclusive car was sold in March by RM Auctions for over $2 million at the Amelia Island Concours d’Elegance. The sale was noteworthy as none of these cars have ever traded hands in the secondary market. When I sat down to write the article I felt my negative supercar bias begin to kick in. I’ve never been a big fan of “bling bling” supercars. Even if I had all the money in the world I just would not put a Bugatti Veyron in my garage. But as I began to read about the Huayra something unexpected occurred. The more I read, the more I became intrigued. After six hours of intense research I became obsessed with the Huayra. The Pagani is no ordinary supercar. More than the car itself, what really got me inspired was learning about the extraordinary person behind the Huayra. Horacio Pagani is the definition of the Modern Day Renaissance Man. After my wife Sarah performed hours of editing, I submitted the article to SCM and Chester gave it the thumbs up. The real surprise came about five weeks later when I learned that my article was going to be the cover story for the June 2016 issue of SCM. I emailed Chester with jubilation. His response: “Welcome to the Land of Cover Stories. It’s kind of like Hotel California, but in this case you never want to leave.” Having the cover story in SCM was an honor because I have enormous respect for what Keith Martin and his team have accomplished with the magazine. I can now say with confidence that I had my Andy Warhol fifteen minutes of fame. The link below takes you to the story.